The world of Astro City is rife with superheroes and villains, so it is no surprise that there is one who called himself “The Beekeeper”. 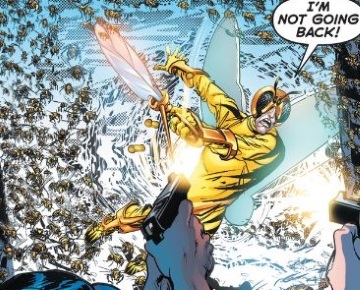 As ever, the superhero universe Beekeepers don’t get too creative with their names. This Beekeeper was active in the 60s as a super-criminal. Using a weapon called a hive-scepter, he was able to control bees to do his bidding, and was probably able to fly given those big wings on his back. We don’t know how successful he was as a criminal, but we do know he ended up getting caught and spent time in prison. After that, he gave up the life of crime, became an entomology professor, and lived a normal life until he was in his eighties. At some point, he seems to have sold one of his hive-scepters, which was a mistake, because someone used it to frame him for some crimes. When the police came to investigate, the octogenarian reacted poorly and got back into costume and fought back. It’s sad that it happened, but it does say something about his fighting skills that it took a lot of police to bring him in, even in his advanced age. Astro City’s Beekeeper has only had about three pages of screen time. Sure, he gets to boss around bees and fly, but we don’t know what else he’s got. Did he have a whole beehive-themed lair? He could have. We just don’t know. We don’t even know if he actually kept bees for non-crime purposes. The fact he ended up teaching suggests that he knows about them, though. I always dock a point for beekeepers who turn to evil, it’s a sign that they can’t contain their Beekeeper Rage, but it is a shame that I have to do it for this guy. He stayed on the straight and narrow for decades between his initial crime spree and when he was framed. But still, he has to lose that point for villainy. 3 Honeycombs out of Five. Given Astro City’s nature, we could learn more someday. I don’t expect it, but I can dream.